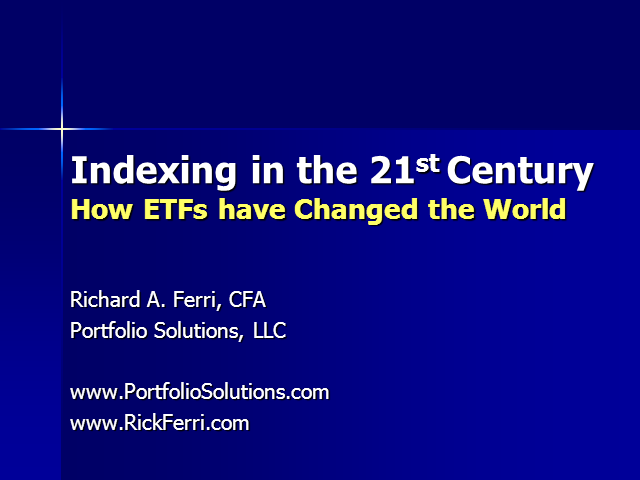 Author of six investment books, Richard (Rick) A. Ferri, CFA is a leading expert on low-cost index fund investing. Through his work as a researcher and investment manager, he continually monitors and evaluates the latest trends related to index funds and exchange-traded funds (ETFs). Rick utilizes his in-depth research about index fund investing strategies to guide the Investment Committee of Portfolio Solutions, the low-fee investment management firm he founded in 1999. In addition, he shares his insights as a frequent news commentator, Forbes columnist, media contributor and public speaker.